Since we were parked right there, we took the short trail from the parking lot to Madison Falls. It’s one of the few handicapped accessible trails in the park and a real pocket gem. 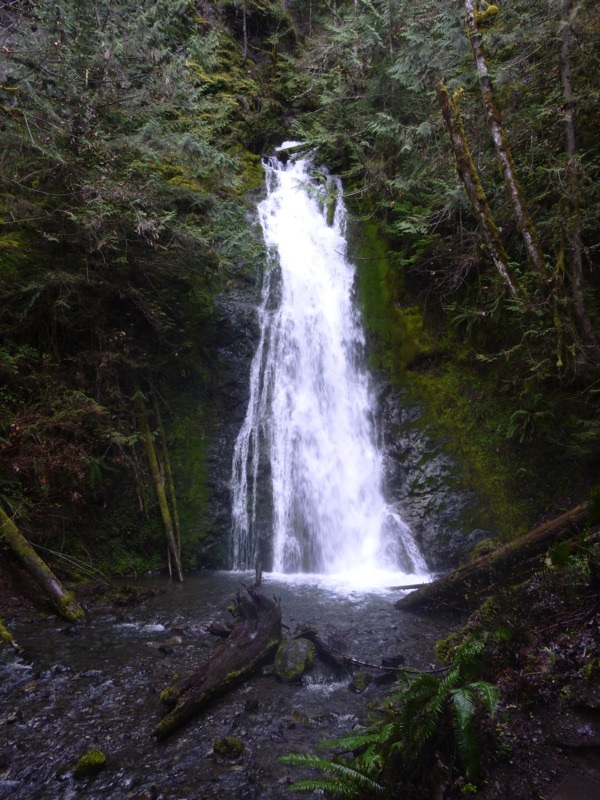 The falls here are not as high as Marymere Falls or as thunderous as the falls at Sol Duc, but they are a definite lift to the spirits. 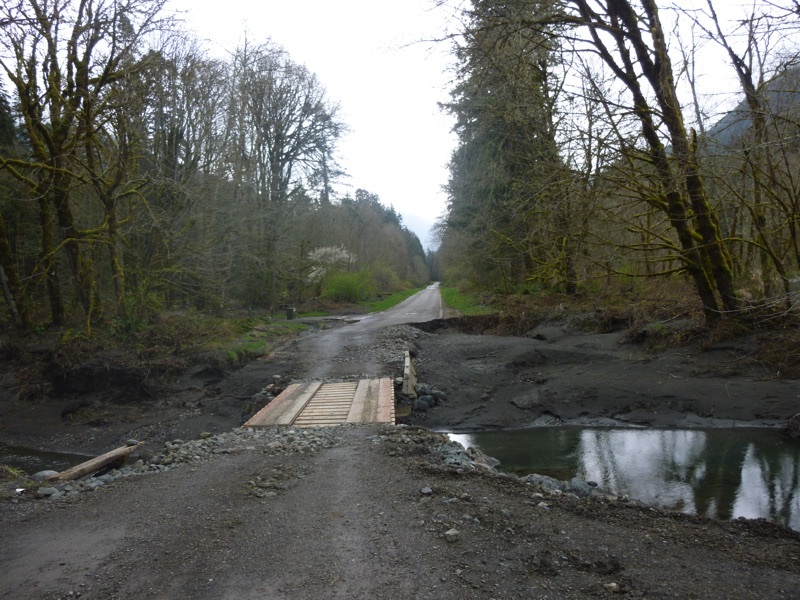 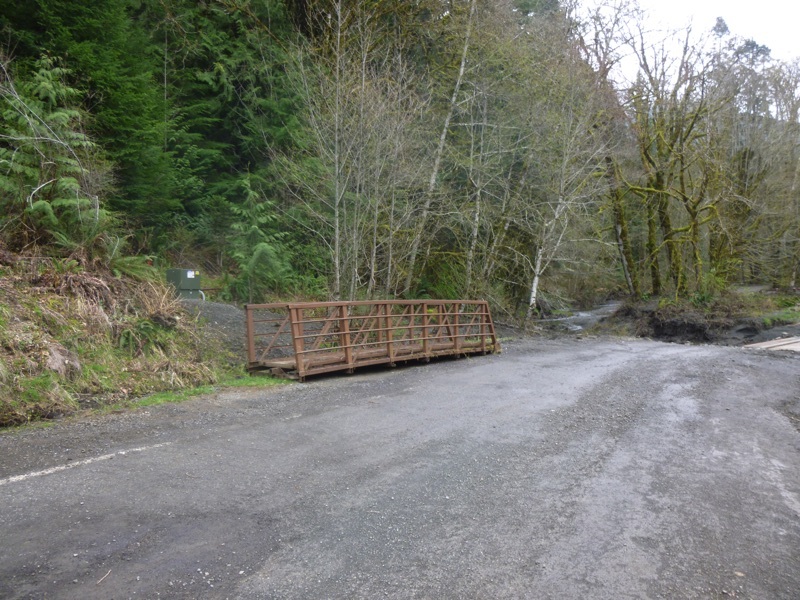 The story is that there will be a new temporary bridge over the washout by early summer. 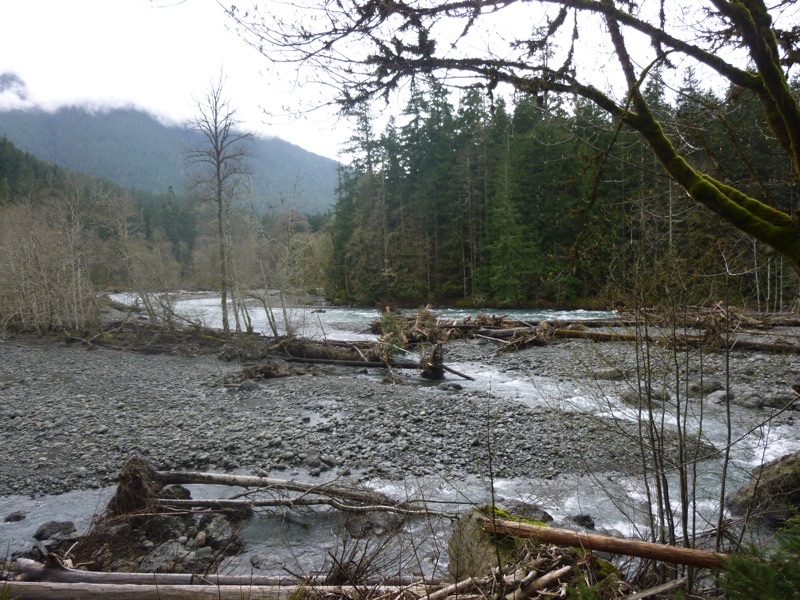 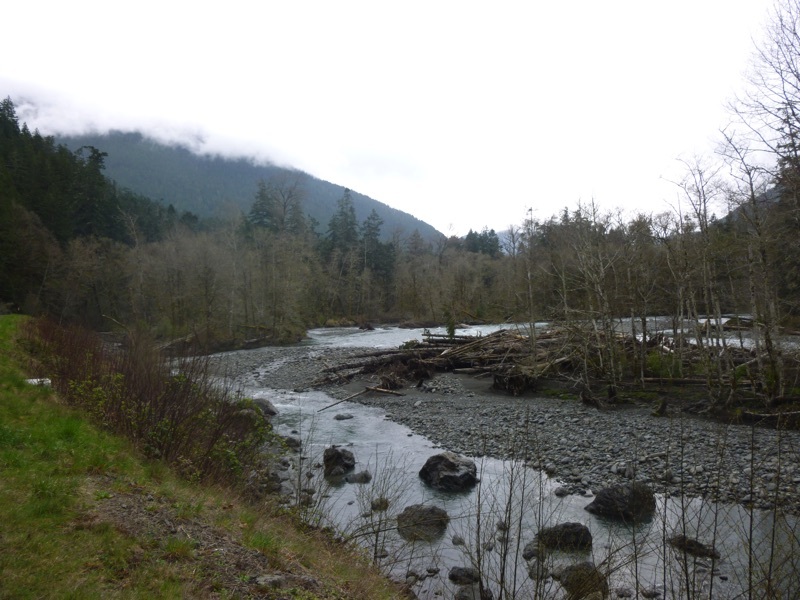 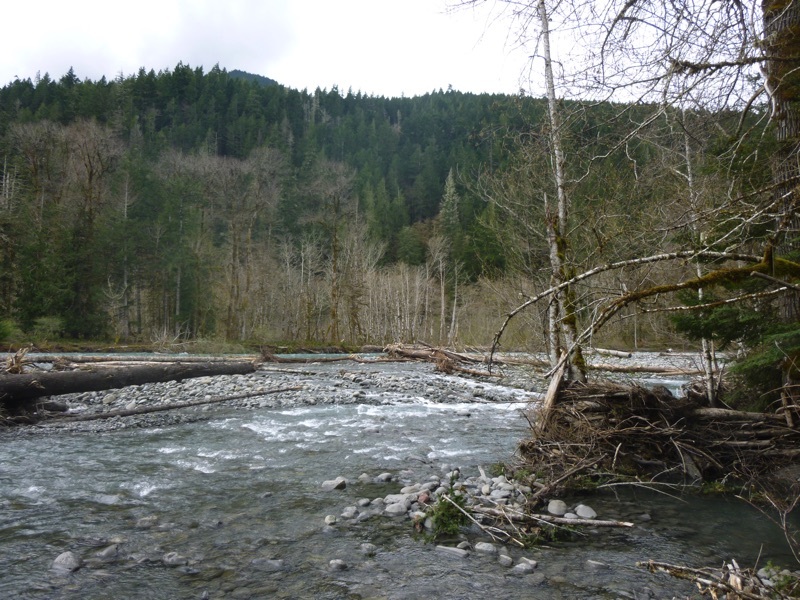 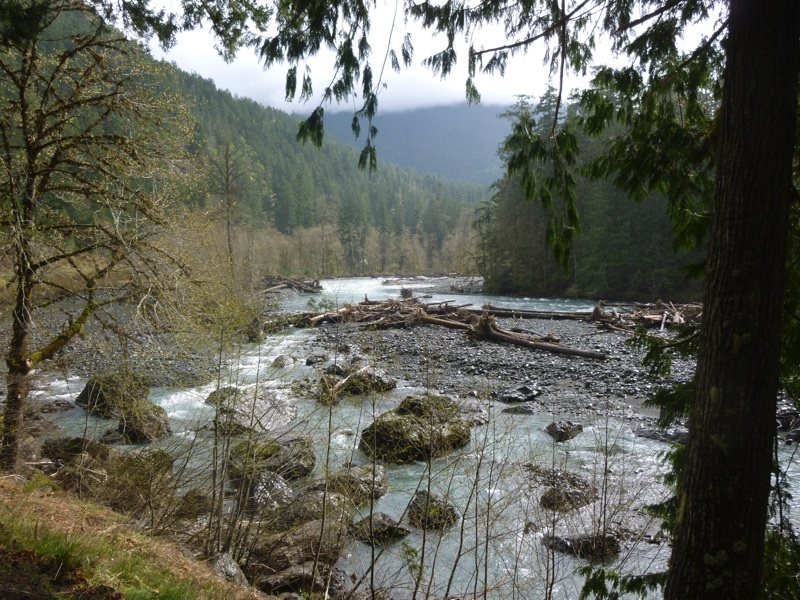 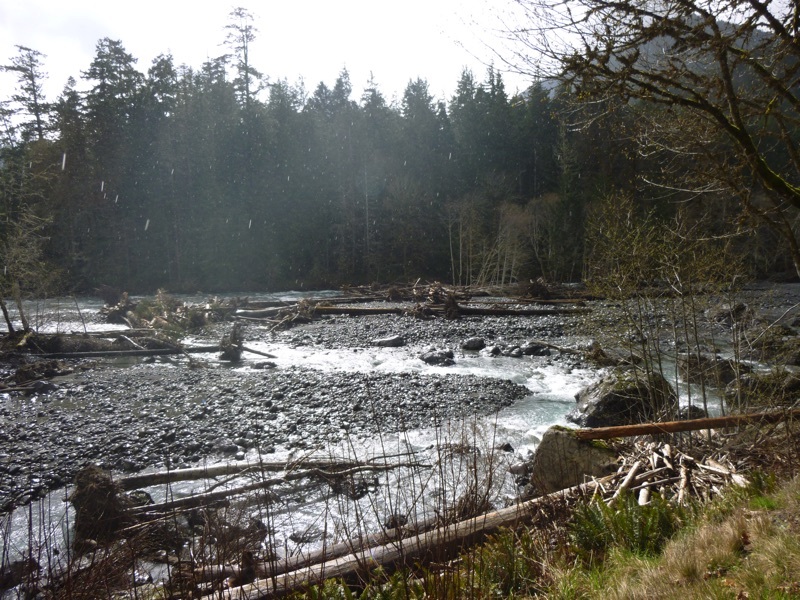 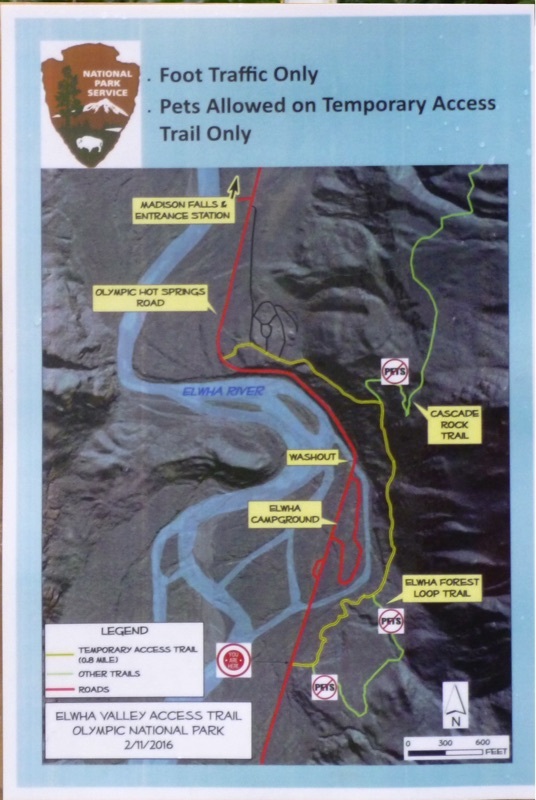 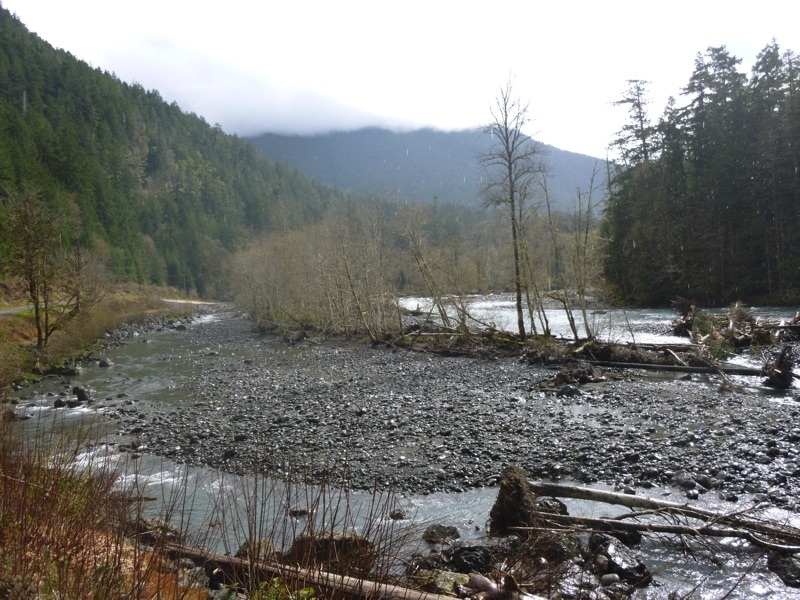 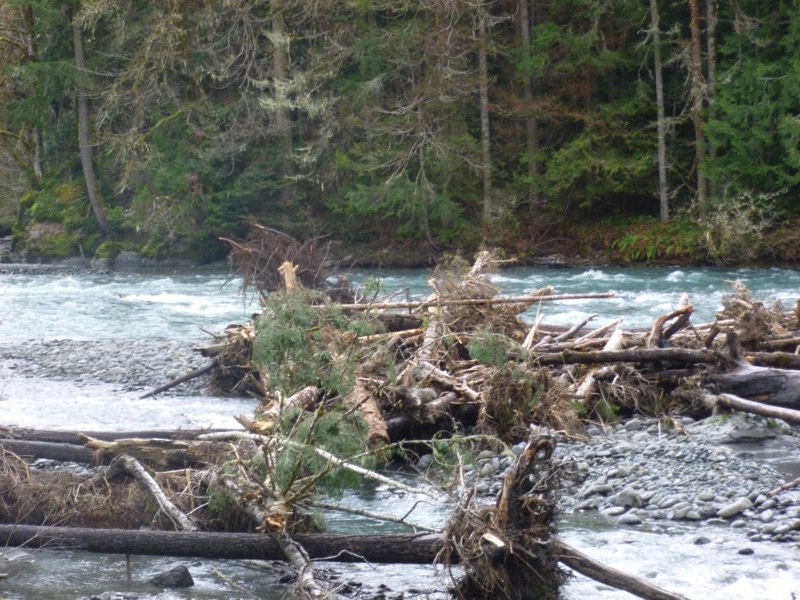 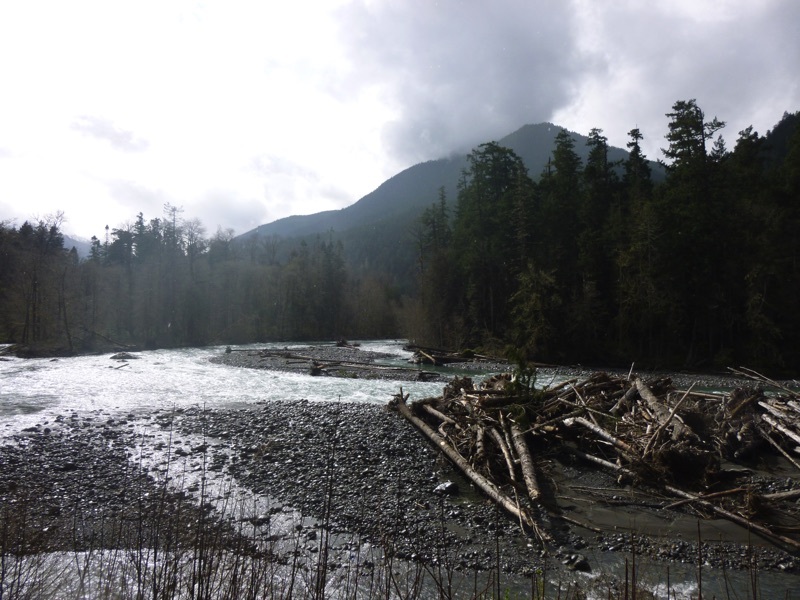 Any more long term solution will have to take the undammed Elwha River into account. 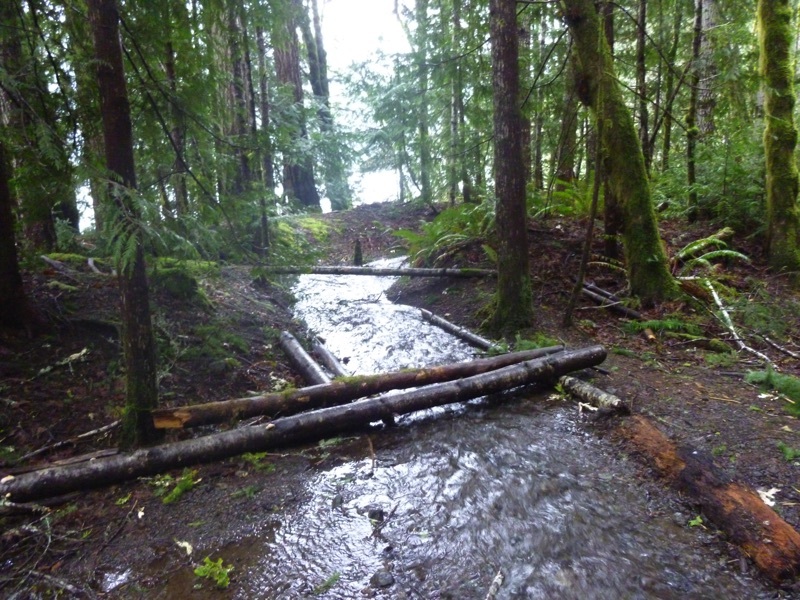 Rivers have lives of their own, so little side streams that were easy to ignore when the river was controlled may be major challenges. 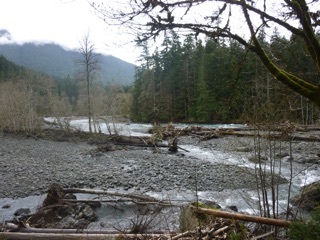 The campground, long high and dry for the most part, is now on a flood plain, as is the road. 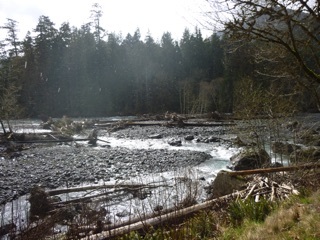 It may take some more serious shuffling and rethinking to keep the area open now that the river runs wild. 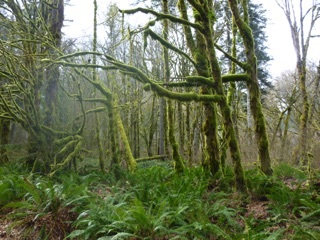 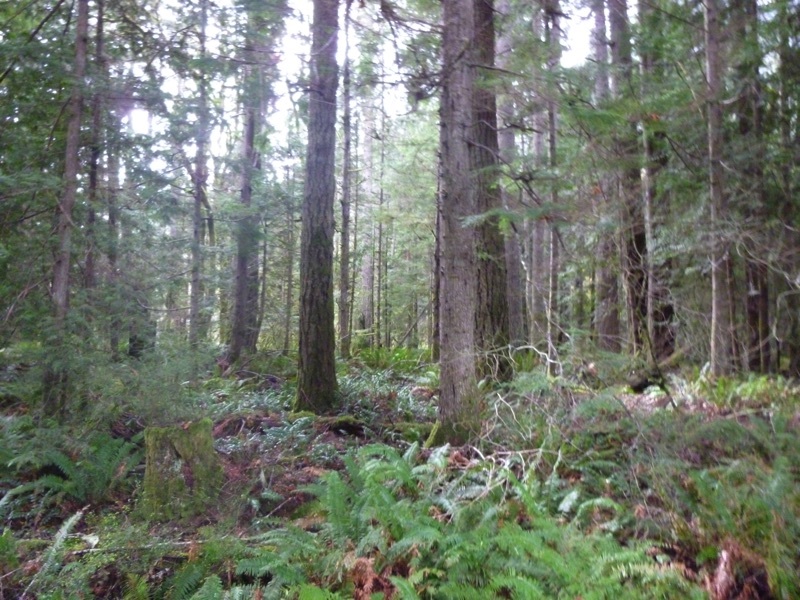 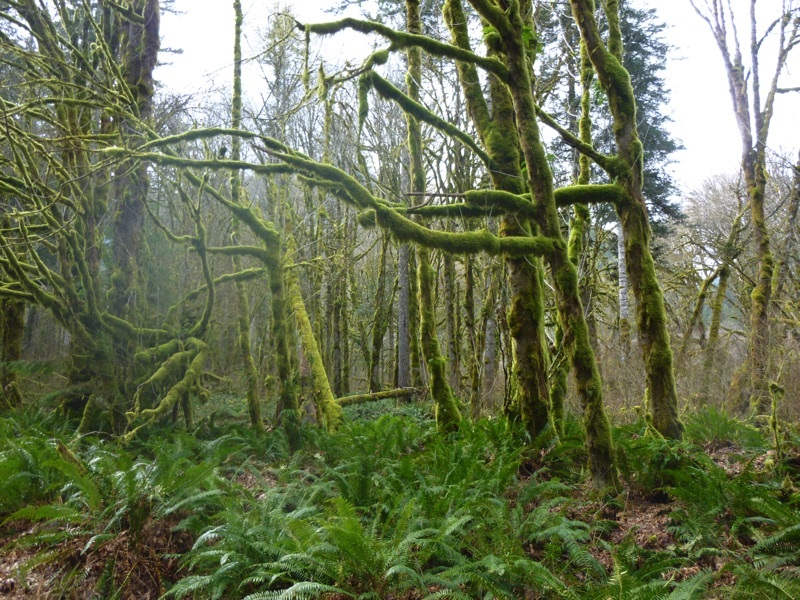 More Elwha: we were impressed. We parked near the entry booth at Madison Falls and made our way up the river along the road. 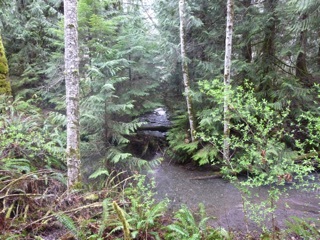 We had a glimpse of the river near the parking lot but then stayed inland for a bit. 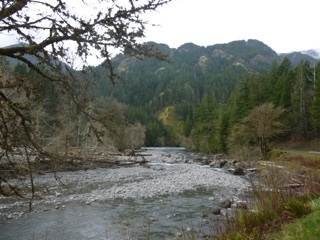 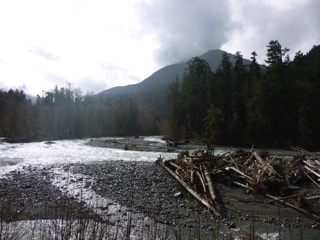 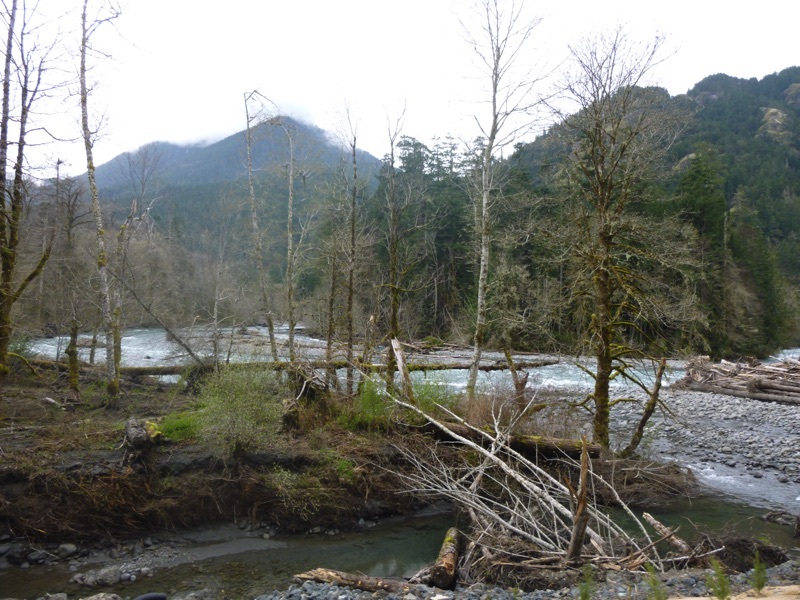 Then the road turned, and we had a great view of the new Elwha. 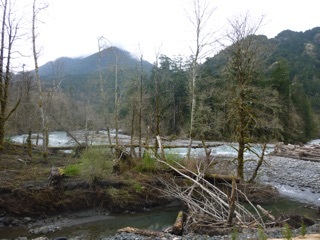 There are a couple of sharp turns here, so when the road is open all we get is a quick impression, but on foot we could walk along the river. 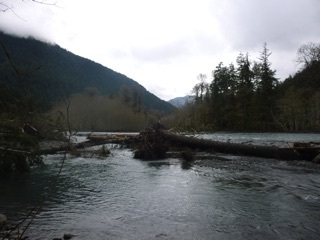 The river is much wilder than before the dam came down. Big trees and big rocks seem to have been tossed here and there, and the river has been exploring new channels, sliding around tons of gravel in the process. Then we crossed the temporary bridge, a sturdy wooden thing over a side channel that had washed out the road entirely. 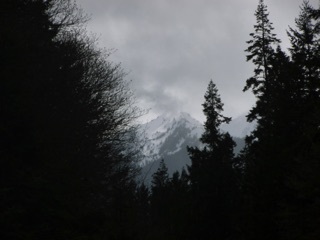 We continued along the road and could see one of the snow covered mountains looming ahead of us. 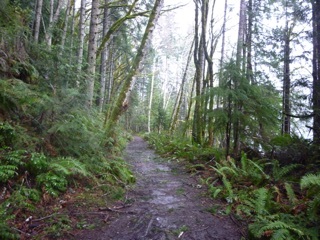 There were a few hikers heading that way. Two were going to camp at Humes Ranch, and a cheerful but overly optimistic group was aiming for the hot springs. 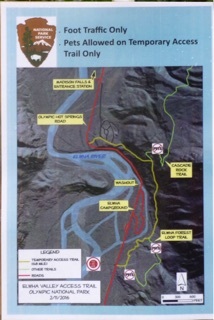 We were much less ambitious. 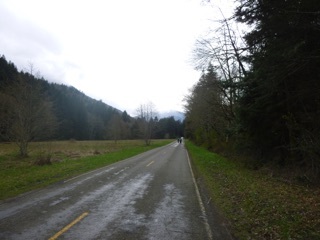 There were thick green forests on either side of the road, but we found a side road leading off towards the river. 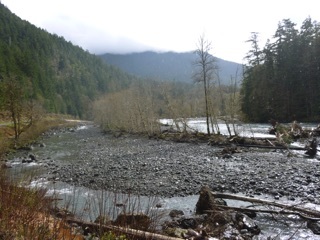 The side road ended with a wash out, but we made our way to the river’s edge for another good look at the new river. 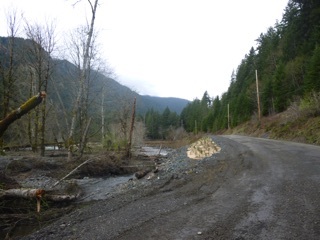 The road to the Elwha river hiking areas washed out some time ago. There are plans afoot to reopen the area, but so far there is only a temporary pedestrian bridge. 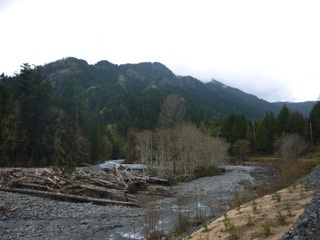 Missing the area, we decided to do a bit of exploring, so we turned off 101 onto Olympic Hot Springs Road. 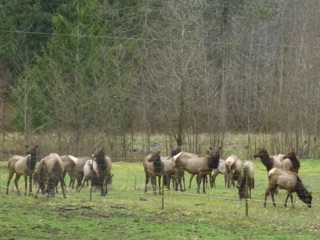 On our way to Madison Falls, the end of the undamaged road, we noticed a field full of elk, so we stopped and took a few pictures. 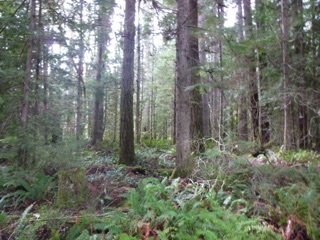 Elk are usually pretty calm and easy to photograph. 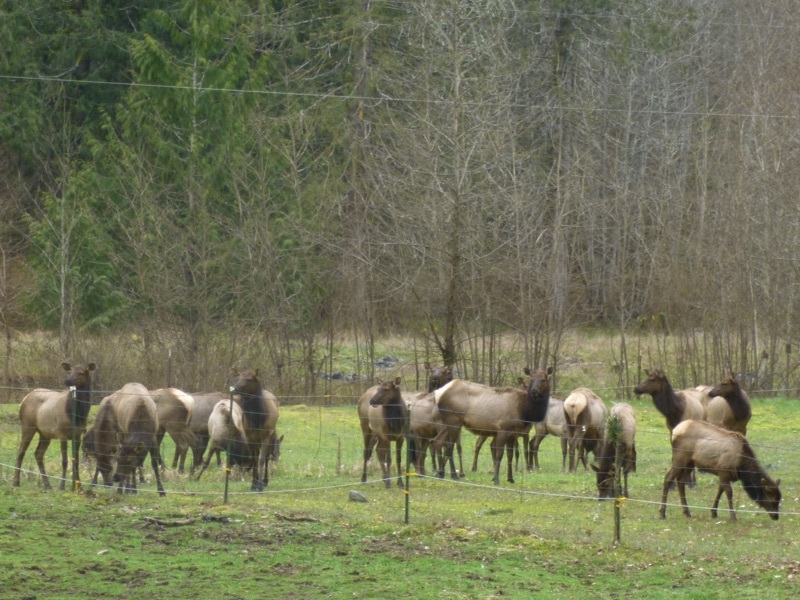 In general, amateurs should avoid trying to get dynamic elk action photos. 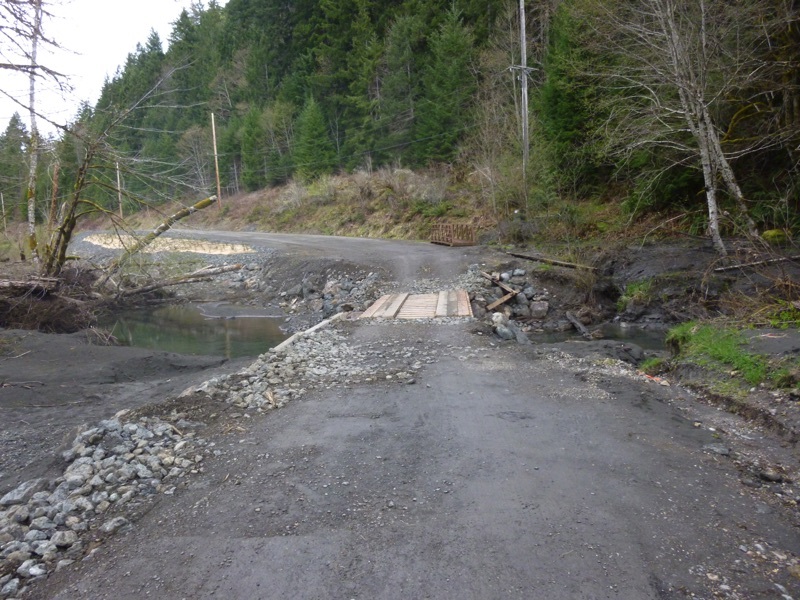 Leave that to the professionals. 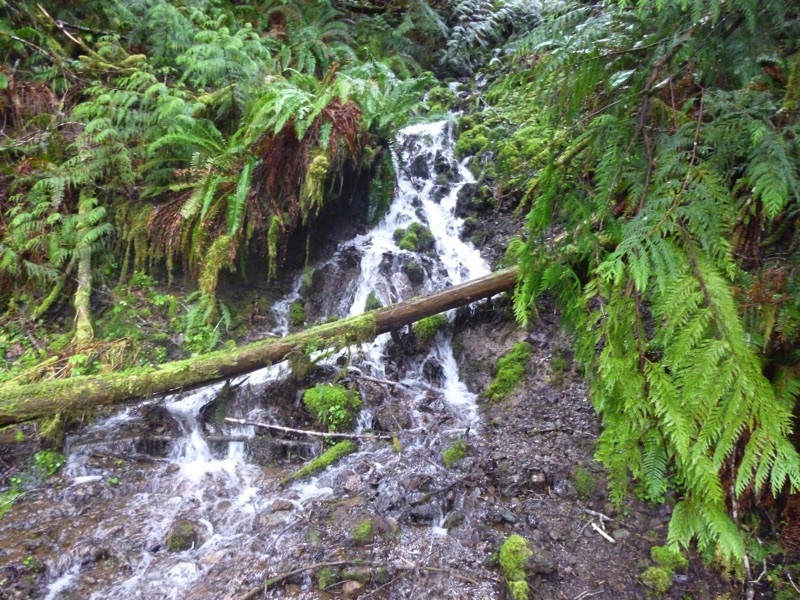 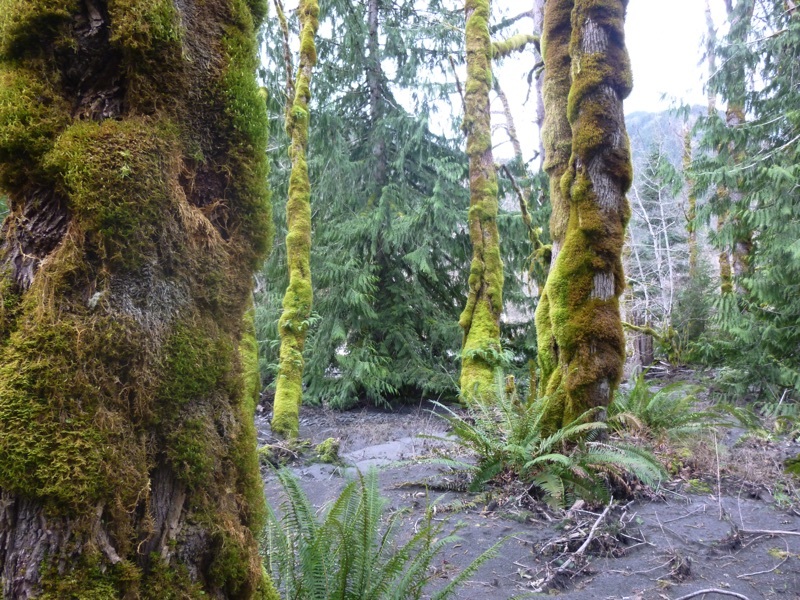 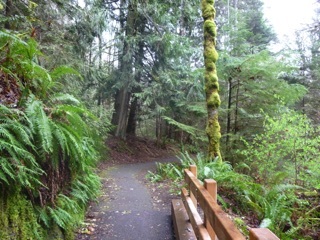 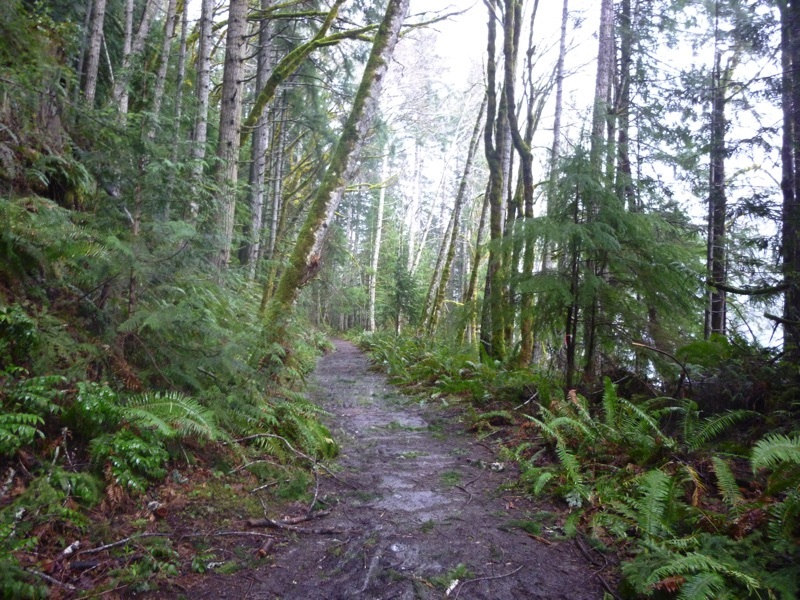 We were out on the Spruce Railroad Trail along the north shore of Lake Crescent recently. 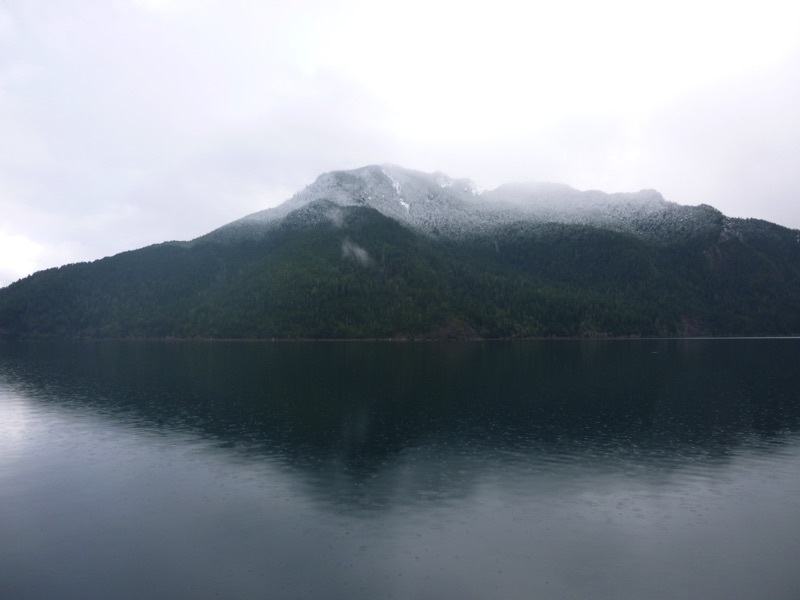 We had a great view of Storm King with its upper reaches dusted with snow. 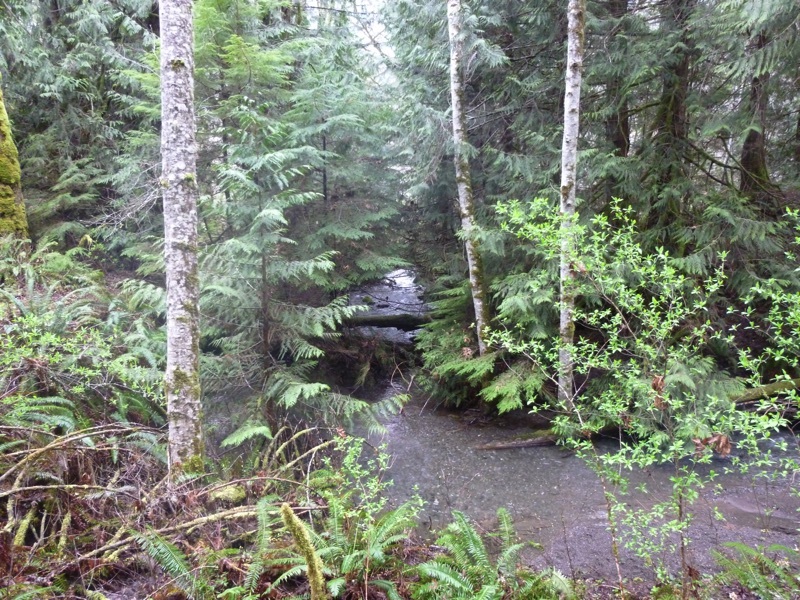 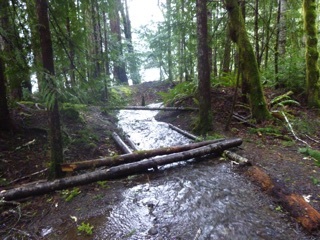 There was also a lot of water flowing into the lake on the various little streams the trail crosses. 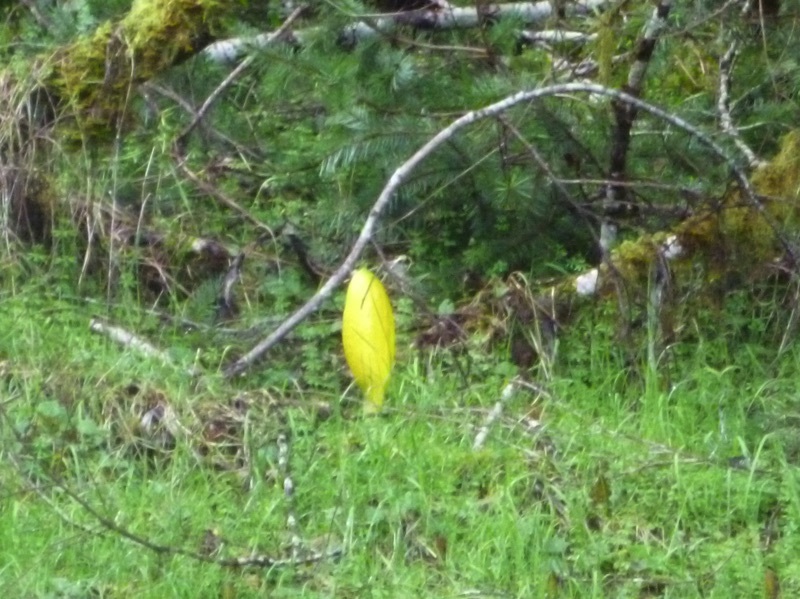 Even better, a sign of spring, our first skunk cabbage of the year. 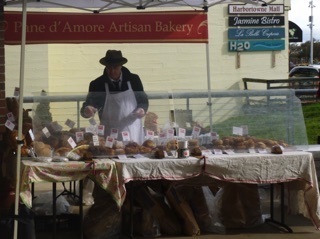 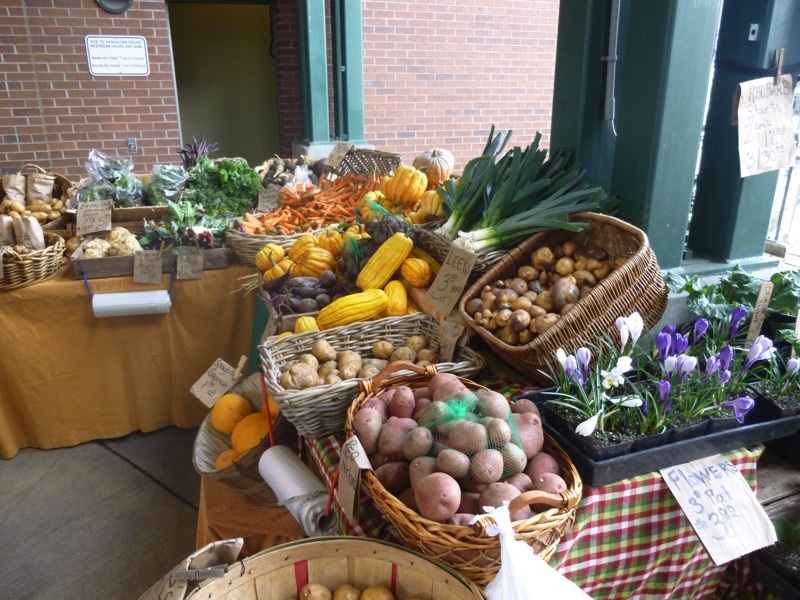 It has been a while since we’ve last done a farmers’ market update. Let’s face it. 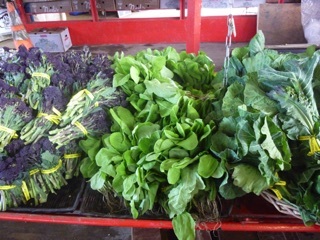 The pickings can get rather slim in mid-winter, but now spring is approaching, and things are looking green. 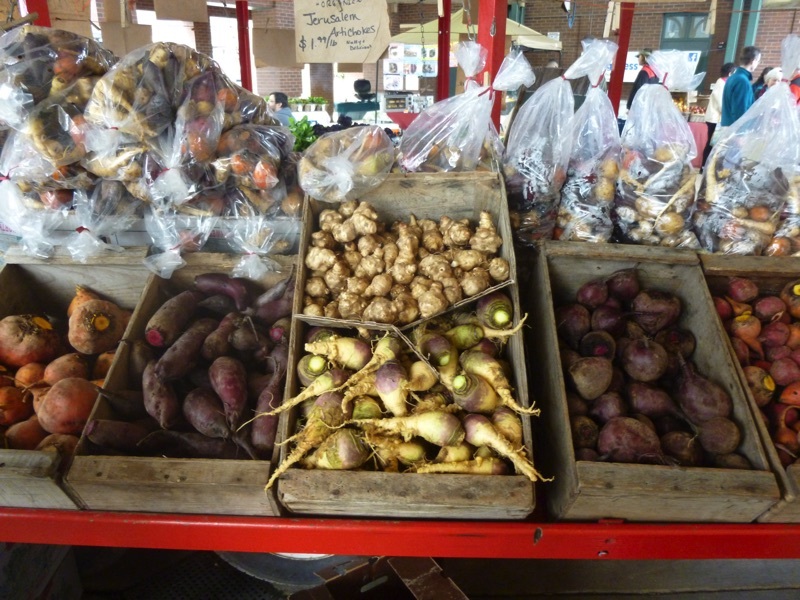 Johnston Farm was back with winter greens and potatoes. 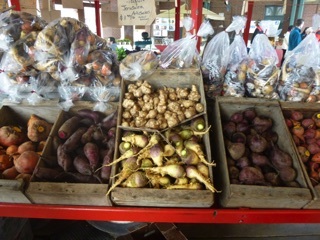 Nash Huber was also there with late winter goodies. Spring Rain Farm had arugula and turkey eggs. 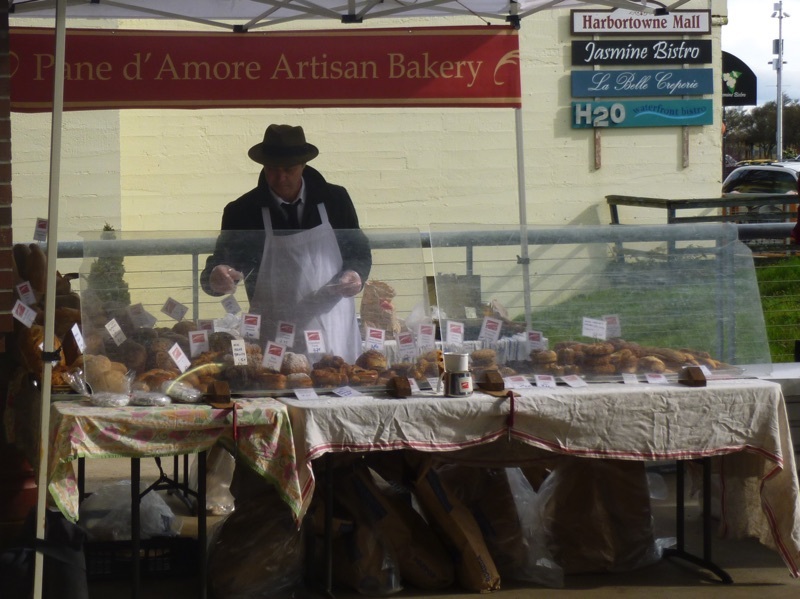 They also sell chicken eggs and duck eggs. 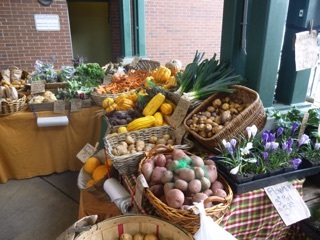 Duck eggs have hard shells and lots of creamy white. 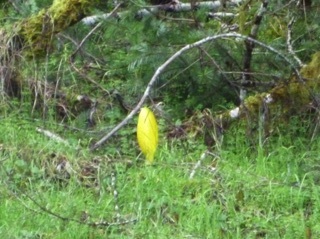 Turkey eggs are pointy and, we were told, have lots of rich yolk. 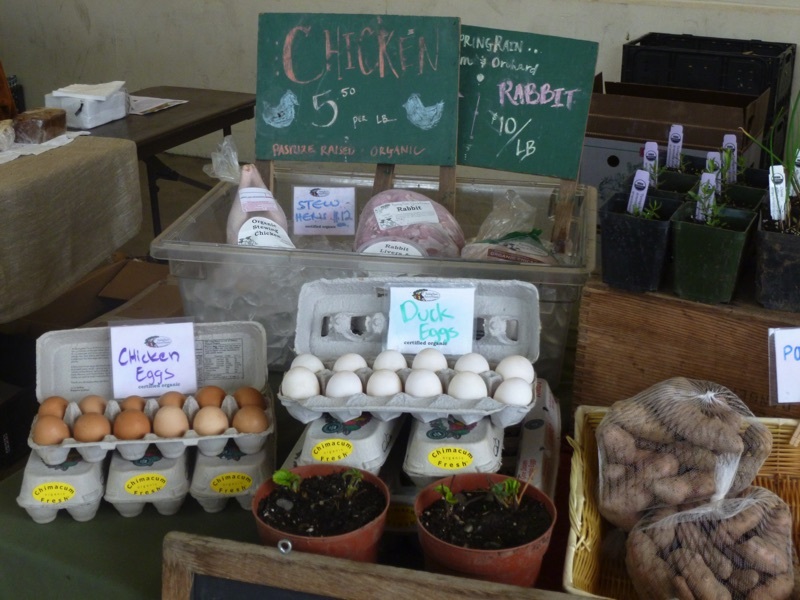 UPDATE - We have now tried the turkey eggs. They were meaty and yolky and delicious in a chorizo revuelto. 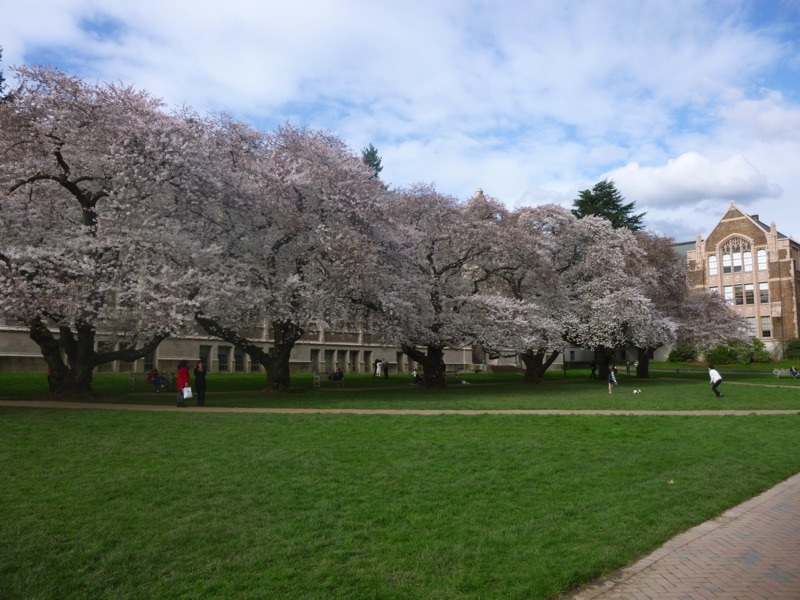 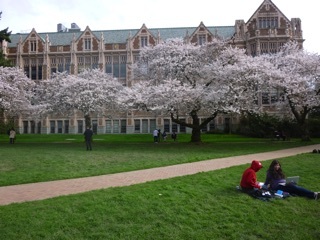 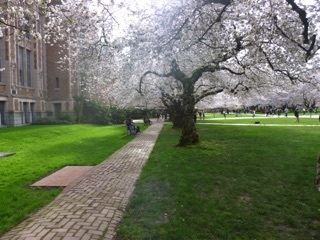 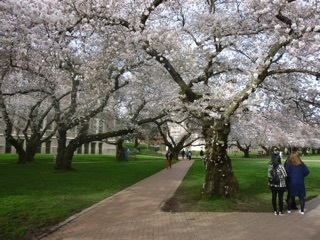 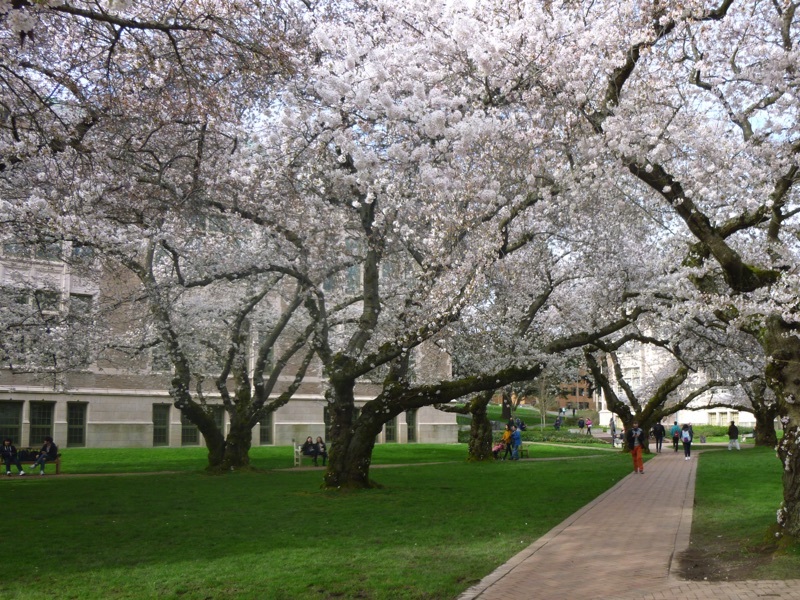 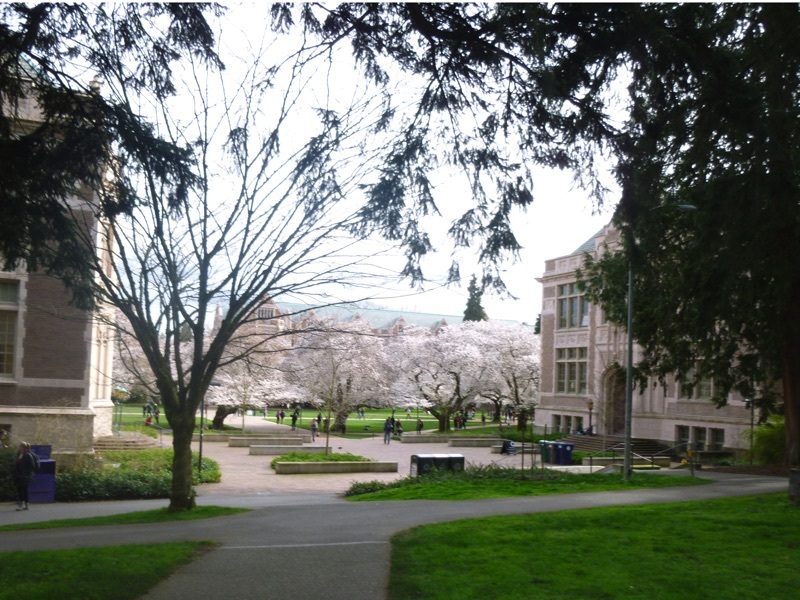 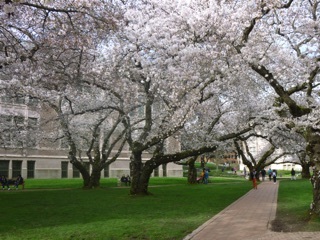 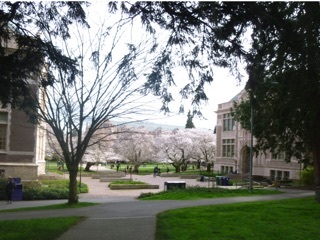 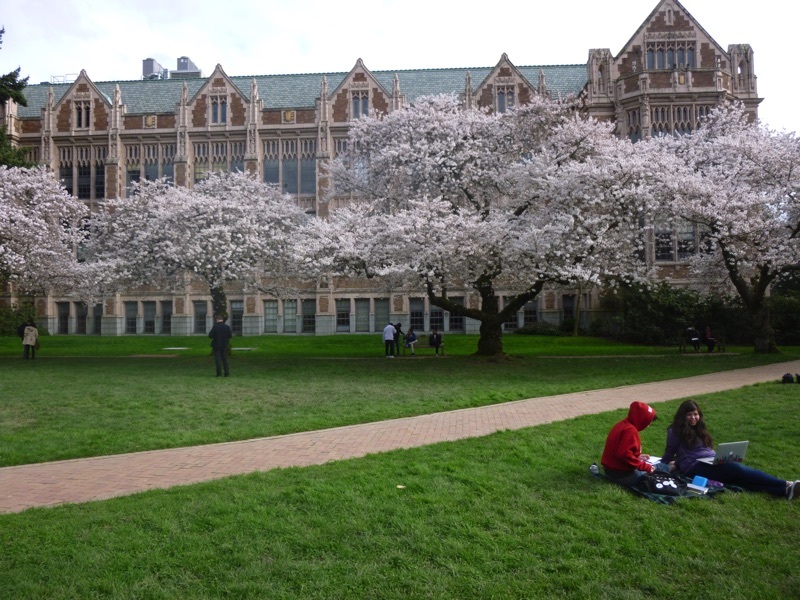 Washington State University has a beautiful campus including a quad filled with Yoshino cherry trees. 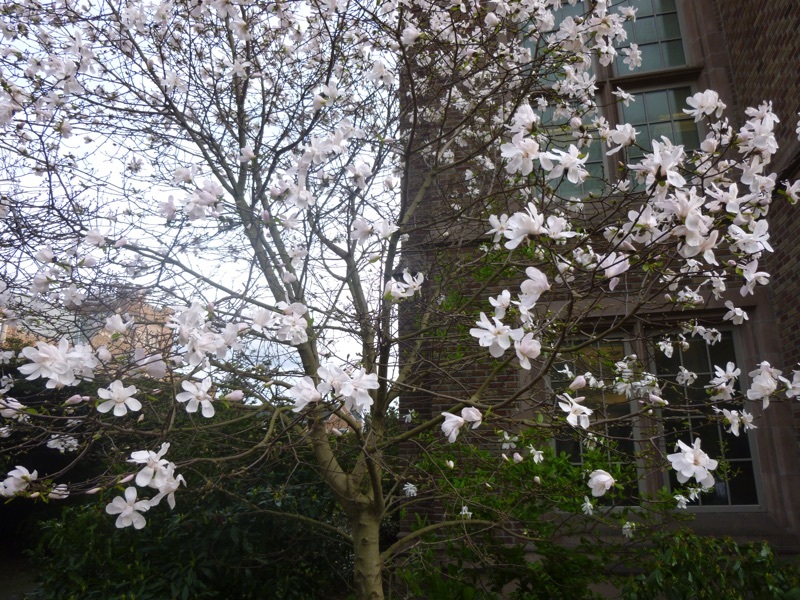 They usually bloom the second or third week of March, but this varies with the weather. 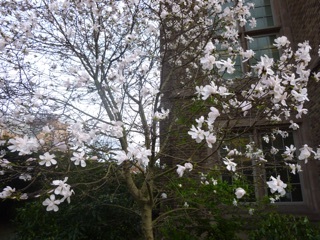 We lucked out on our most recent trip to Seattle and saw the blossoms at their peak. 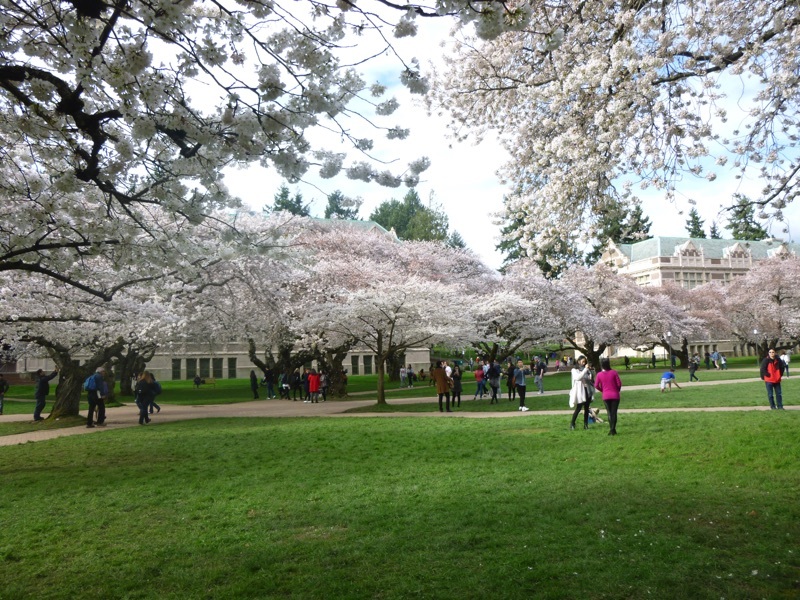 The quad was full of people admiring the 80 year old trees and taking pictures. 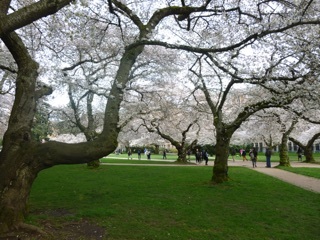 Some were serious photographers who were actually using cameras instead of cell phones. 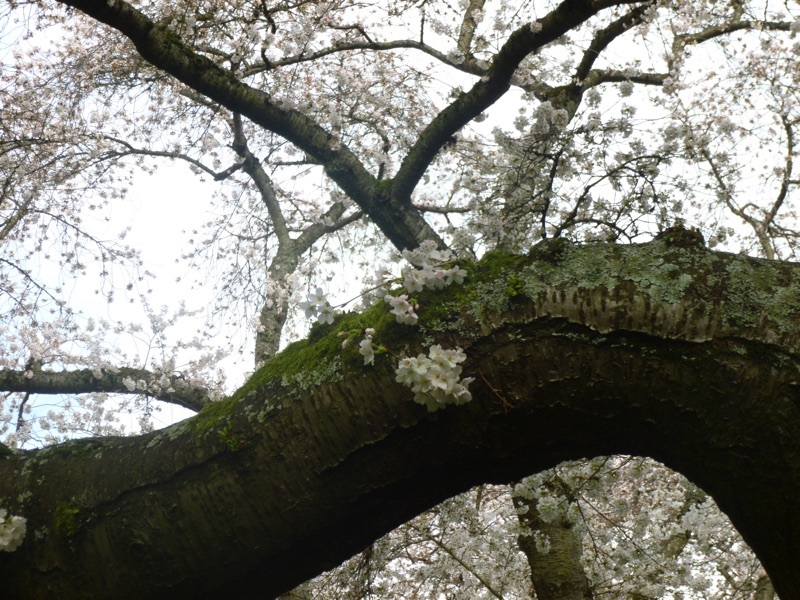 The trees were full of flowers, clouds of them, light pink set off by the dark bark of the trees. 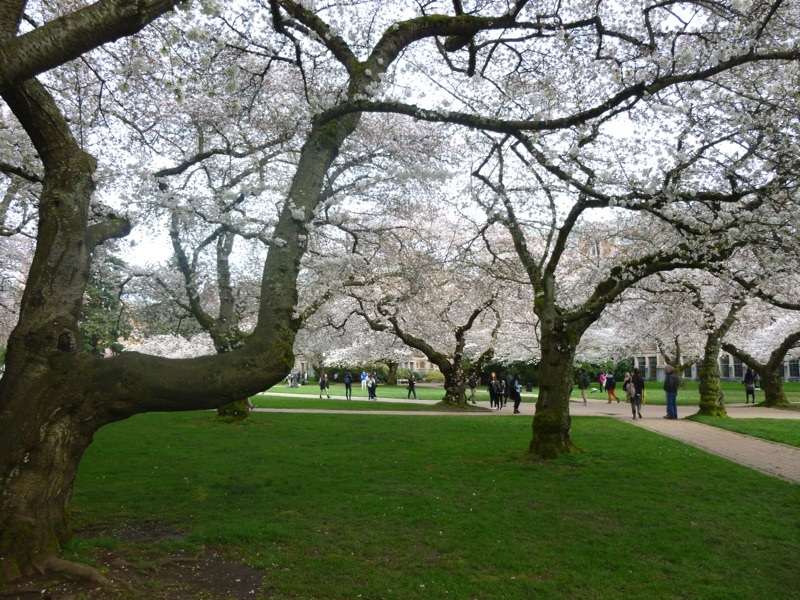 We made a lazy double loop of the quad exploring the pathways with the laden branches arching overhead. 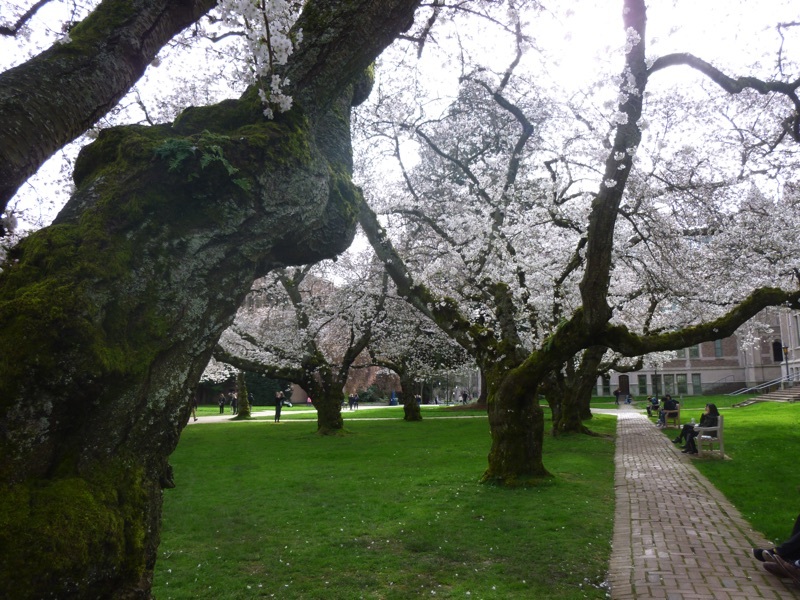 That’s enough labored prose for now. Enjoy the pictures, just click to see the larger version.